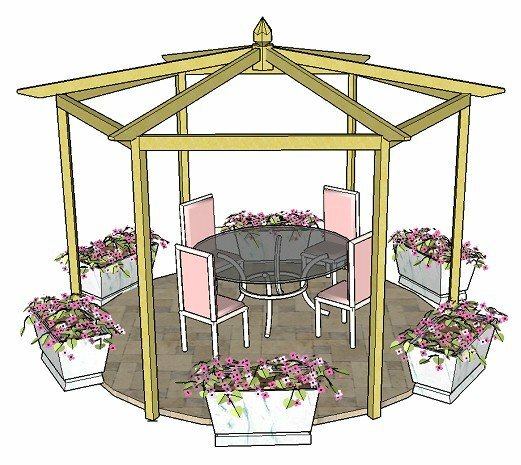 Whether you have already decided what type of garden furniture you would like and would just like a few pointers, or you need some inspiration on particular styles, colours or materials, take a look at some ideas for making the most of the wonderful selection available. The range of products today is quite astounding, and with so many materials, styles and colours to choose from, in both classic and contemporary styles, you’re bound to find something wonderful that will fit the bill, transforming your garden into a really special place! 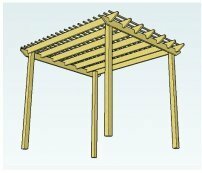 Bare in mind that positioning and arrangement of your garden accessories and furniture are both really important factors in ‘making or breaking‘ your outdoor living space. 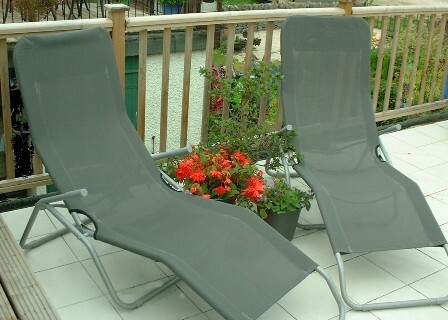 Quality garden furniture, however expensive, in the wrong place, can look very ordinary. Ever seen a really good quality, hardwood set of dining furniture with bottle green fabric and accessories stuck in the middle of a sloping lawn? Hmmm! On the other hand, affordable items, placed carefully and with thought given to colour, accessories and planting schemes, can look stunning! Colour can also be significant in determining the style of your furniture. For instance, the same furniture can be used to give a cool stylish feel, or you can make it into funky garden furniture by just by changing the colours used. This is where your creativity comes in. Try to envisage the effect of colours against your existing structures and planting. Using the correct colours can make affordable garden furniture work well for us all. It can exude quality and taste, be fun, funky, comfortable, welcoming, or really stand out in the crowd! I find that the best colours for a really cool contemporary feel are plain greys, creams, off-white and beige - in other words, natural or neutral colours. Even patterns can be effective (such as checks) if they are in neutral colours. 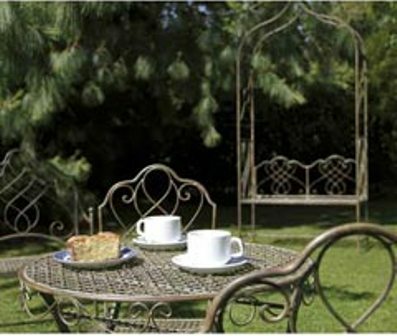 Wooden garden furniture looks great with cream accessories, for example cushions, parasols, ceramic light holders. Grey garden furniture looks good with cream too. A way of using brighter colours in a contemporary scheme is to use acid lime, azure blue, shocking pink etc. as accent colours against neutral surroundings. These can be effectively used together in a pattern, separately within different accessories, or on their own. It's the same principle that can be used for planting. 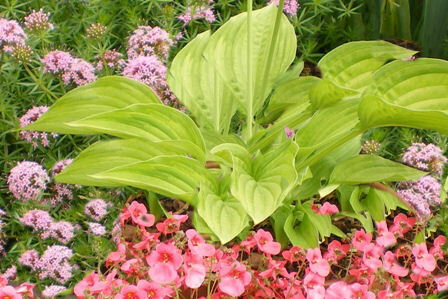 Take a look at the lime green of the hosta against the pink of the diascia: it really makes the colours come alive. You could use lime green cushions or beanbags to offset dark and silver greys, pinks and purples of all shades, and white. Alternatively, use the planting for the accent colours! And here we have cool and contemporary surroundings with a shot of red to highlight the scheme. Of course, much depends on whether children (and the male of the species eating their BBQ, too!) will be using the furniture: sticky fingers, dropped food and footprints will detract from the look, if cream is the colour you chose, unless it is in a man-made fabric that can be wiped down easily. So ,again, think of the purpose, and work around it! 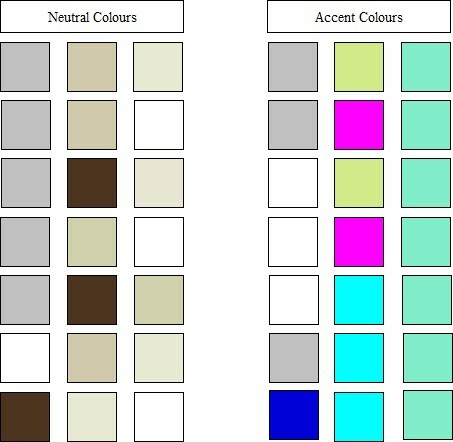 Take a look at some sample colour schemes that will give you ideas on the types of colours that go well together. They have been grouped in blocks of three, although there are many more combinations that you can try. It's probably a good idea to cover surrounding rows, as you look, to stop interference from other colours. To get a bright, fun feel, the colours used tend to be primary colours - red, blue, yellow, and secondary colours - purple, orange, green - either in plain materials or patterns. Checks, flowered, striped, plain can all be used together, in any combination! At one time, putting certain colours together, and even patterns, was seen as being lacking in taste. For instance, red, orange and pink were rarely seen together. Floral and checks too. But now anything goes! And with the influences of travel and our wonderfully diverse society, fashions, relating to colour schemes and pattern combinations, have changed considerably, giving us a rich array of fantastic materials to choose from. Make a statement in your garden. Use colours that suggest a style, in order to make it into a wonderful, individual space. I, personally, would avoid the predictable and ordinary, for example, dark wood furniture with bottle green accessories. Just because grass is green and trees are green, it doesn’t mean that everything in the garden has to be green! Having said that, green is not just ordinary mid-range green. It can be acid green, lime green and many other wonderful greens that can give a brilliant accent colour to garden furniture and accessories. Look for colour combinations that work well together and set each other off. It pays to carefully consider colour schemes, and the coordination with planting and accessories, especially if you are trying to achieve a particular feel. With this in mind, take a look at the ideas above and begin to form a picture in your mind - or even on paper! - of the effect you would like to achieve in your own garden. Hopefully, the suggestions given will help you to focus on what will work for you. 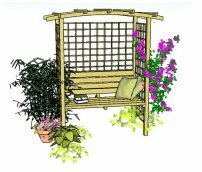 As we spend more and more time in our gardens, it is a wonderful opportunity for us to create a comfortable, welcoming outdoor space in which to escape and recharge our batteries. A little careful thought now and you will create a fantastically individual, comfortable and unique space!